Last week, Shannon Whisnant of Maiden, SC purchased a barbecue smoker at an auction... he wasn't bargaining for what was inside. 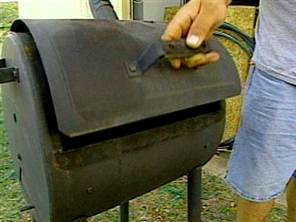 When he got it home and opened the smoker, he thought that he found a piece of driftwood wrapped in newspaper. When he unwrapped it, he found a human leg that had been cut off 3 inches above the knee. The leg was taken to the police who determined that the leg was not removed in the commission of a crime. They handed it over to a local funeral home and began to look for the man with a missing leg. Unfortunately, Mr. Wood didn't pay the storage facility, so they sold the smoker at public auction... not knowing that it included a leg. That is when Mr. Whisnant purchased it. Of course, Mr. Wood wants his leg back. Not so fast. Mr. Whisnant is the owner of the leg. He has a receipt to prove it. Being an astute businessman, he realized that he could make some money on the leg. After all, he was charging adults $3 and children $1 to look inside the empty barbecue. Just imagine what he could make if the leg were still in it! He offered to share joint custody of the leg with Mr. Wood... but Mr. Wood wanted nothing to do with it. So, Mr. Whisnant threatened a lawsuit. As of last report, authorities say the leg will be returned to Mr. Wood. After all, he grew it. I hope Mr. Wisnant is generous, because legally, Mr. Wood doesn't have a leg to stand on. I thought your last line was the best!